form below. We look forward to hearing from you. Traditionally, coopers were trained to make a very specific type of container whether it was a bucket, a barrel, or a hogshead. 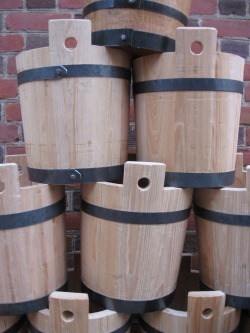 Although the process of making other types of cooperage is virtually the same, coopers usually worked on the same type of container, day after day, month after month. With this specialization came speed and efficiency. Jamestown Cooperage has chosen to continue this tradition and has designated 2010 "the year of the bucket." Your order of a wooden bucket will support this age-old tradition and ensure that you receive your order promptly. Of course, we welcome orders for other types of coopering - just contact us for details. Wooden bucket prices range from $110 - $200 depending on the type of wood. Prices are dependent upon the current market value of wood and iron. We generally use cedar, white pine, or oak. The year of the "bucket"
Although times have changed, these buckets have not, and will to serve the same purposes as they did years ago. In addition, your wooden bucket is perfect for holding magazines, newspapers, or kindling or it can simply serve as a decorative piece in your home or office, standing guard at your entry-way or near your fireplace. Click here to learn about proper care for your cooperage.